There are those days:who says the dentist isn’t fun? Yikes! Honestly I was a good sport but in my mind I had to fight off a panic attack. I salivate like a saint bernard and my jaws were never meant to open that wide. With all that, I feel like I can’t swallow enough and am near drowning on my back with both of the dentist’s hands in my mouth. Top that off with a nerve that refuses to numb despite repeated shots and you have a drilling torture chamber. His final words were “Just hang in there. I’ll be done soon.” This nighmare took 2 hours and 20 minutes of my precious time off. Boohoo! Sigh. But on the bright side, because I knew I was going to be a hot mess I minimized the misery by telling the dentist I needed a bite block to rest my jaws and I wanted to hold the suction so I wouldnt feel like I was drowning. 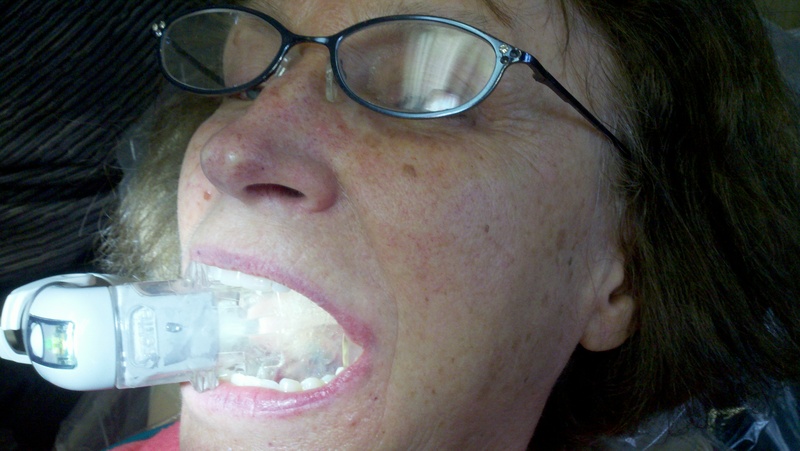 This is what they brought out: an “isolight” that comes with a silicone bite guard so I can swallow, a flange that shields the back of my mouth from the shrapnel when he drills, built in suction and a light. I was not in dental heaven but it was a definite upgrade from hell to purgatory.